The great thing about sustainability is that you can choose what is important for your company. Then, what you do is reflected in your corporate sustainability mission, which will include your construction sites, equipment storage yards, maintenance garages, and your office! Here is a look at five practices for construction contractors to help improve sustainability and resilience for the long term. Why worry about it? These five actions will help drive your green business model and provide efficiencies in processes that lead to reduced costs. Conduct a basic inventory of how much energy and water you use at your offices, how much waste you generate, and where it goes. Decide why you want to save resources and set your goals accordingly. You are going to find that savings resources will save you $$$. 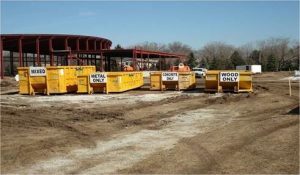 Recycle in your on-site project trailer – a tangible way to impress the project owner! Implement an Indoor Air Quality During Construction policy to demonstrate occupant health protection during construction. You can only improve what you measure. Do you know how much energy, water, waste, or carbon emissions your company generates? It is important not to greenwash, so be prepared to have the data to support whatever you choose to do for sustainability. How can a company be truly sustainable if your suppliers – the raw materials producers, tr ansport and logistic services, component providers, and others along the way are not? 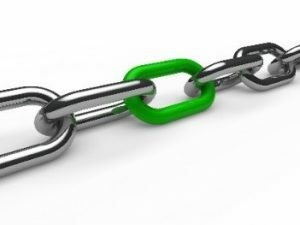 By working with your suppliers to let them know about your company goals for environmental sustainability, leading companies are starting to turn supply chain sustainability into a driver of competitive advantage. Adopting a ‘sustainability by design’ approach to materials sourcing can reduce the impact of materials used in construction – for example, by using alternative recycled/secondary materials, and considering the lifecycle impacts of materials from extraction through to disposal. A large part of construction energy consumption comes from the manufacturing of materials used in the building process. To offset and reduce this usage, look to low-impact building materials including recycled and repurposed materials. By using locally sourced lumber, construction firms strengthen the local economy and help decrease transportation costs. Tell you suppliers you want to source sustainably and that you expect them to contribute toward your goals. By working with suppliers to develop a more sustainable supply chain, companies can cut costs, manage risk better, and add value to your brand. A quieter part of the sustainability story is the evolution in construction techniques and materials acquisition that can reduce waste, energy and inefficiencies at building sites. On one of our recent very large projects, the drywall subcontractor utilized drywall prefabrication to reduce waste material and labor costs by approximately 10%. 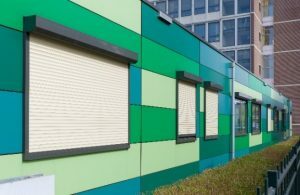 One sustainable material trend in the construction industry is the use of modular buildings. 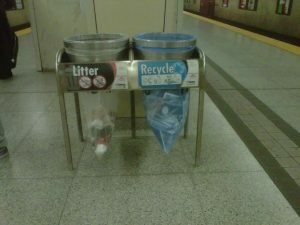 They decrease construction times and minimize waste. The components of these systems are also durable and built to last, so they can be continually re-used and recycled. REUSE When possible – ask your subcontractors if they can take extra stock back to their shop. Some construction firms have storage for extra supplies that can be reused on other projects. 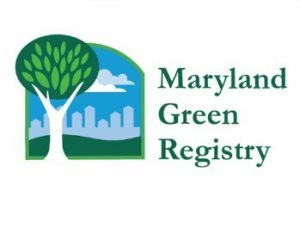 For renovation projects, include a list of local organizations who can take reclaimed materials. They may pick up for free or even pay you for them! RECYCLE NEXT. In today’s construction projects, it is common to divert 75% or more construction waste. If you have a project renovation, used acoustical ceiling tiles and carpet can be recycled if there’s proof of no hazardous materials. For example, one ceiling tile manufacturer will deliver a tractor trailer to your project site during the demolition for used ceiling tiles and take the load away for no cost. Make it easy for your subcontractors to recycle by clearly labeling containers and putting them in the right place. Have an agenda item about construction waste for your weekly job site meetings. While much of the pollution emitted from construction sites comes from the building process itself, efficient energy management of on-site offices and equipment is an important consideration. Use temporary site buildings with an energy performance certificate (EPC) rating of A, B, or C to reduce energy usage. Considering an on-site combined heat and power (CHP) system to transition towards more energy efficient or renewable alternatives to traditional site power.